Spa If you want to enjoy Bali style esthetic in a peaceful atmosphere, Liang Spa is for you. It is located inside of the hotel Alit which is 5 minutes by car from the airport and 5 minutes to the center of Kuta. You will become a big fan of their historical techniques with reasonable prices! Liang spa has been moved to Benoa Square due to renovation. 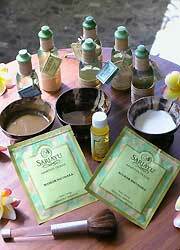 You will get the traditional Bali style massage with massage oil based on natural olive oil. By warming up your body with warmed stones, body metabolism gets improved and removes body wastes. They use herbal balls which help easing the tension of muscles, improving blood circulation and removing toxin from your body. 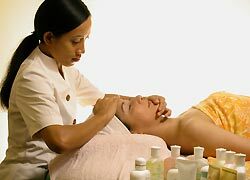 This popular original Indonesian esthetic course provides you hair treatment and neck, shoulder and shoulder massages. You can choose cream from the below. 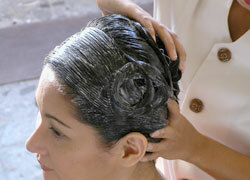 This course includes decollete massage, scrub, massage with cream, steam, etc..., arm massage. At the end, they use cold towel pack and lotions to smooth off your skin. You can choose Facial from the below. This treatment is also recommended for sensitive and suntanned skin. They use fresh coconuts and carrots to heal a whole body. Natural Body Scrub “Lulur” contains herb and spices, and rice powder. They use it and Yogurt Pack to smooth off your skin. Sole of foot has points to improve blood circulation, tiredness and health. By pushing those points with fingers, you will feel your body amazingly refreshed! Based on the theory of reflexology, England style uses finger cushions to give you a gentle sole foot massage. Compared with Chinese style, the push is softer. ★You can choose your favorite healing music from 6 kinds for Shirodara. After Aroma Oil Massage, they use Natural Body Scrub “Lulur” which contains herb and spices, and rice powder, and Yogurt Massage to smooth off your skin. Enjoy a special beauty drink while you are taking a Rose and Plumeria Bath at the end. This course is mainly focused on women’s beauty. Massage with special aroma oil “Bidadari” which means heavenly nymph, Balinese Bust Care (bust massage & bust pack with special oil) and Flower Bath with Rose and Plumeria are included. You will finish the course with a special drink which has great effects on bust up. Two therapists lead you to the deep relaxation by using whole parts of hands and arms. ★For Abhyanga Massage, you can choose your favorite oil from 6 kinds. This course is combination of Herbal Ball Therapy and Balinese Massage Course. Private Room with Light Meal. This course is combination of Herbal & Stone Therapy and Balinese Massage Course. It is in a private room, so also recommended a couple. Free transportation will be arranged for the total minimum payment for one person US＄37 or 2 persons to Kuta, Legian, Seminyak, Sanur, Nusa Dua, Jimbaran and Tanjung Benoa. For 1 person who booked within ＄37, available one way transport with additional ＄5. In Ubud, Tanah Lot and Uluwatu area, it is available with extra US＄20 for one car/one way. *Please contact if you need a transportation not to the hotel but other places. Children can wait at the lobby or the treatment room. There are menus for children over age 6. Jl.Puri Gerenceng, Tuban, Kuta, Bali, Indonesia. I had full body warm herbal ball massage, its scent really made me relax and fell half asleep.